Any level player from beginner to working professional will love this class! 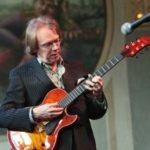 Frank will discuss and demonstrate what makes a guitarist a master at the art of chordal manipulation in playing background rhythm , how to accompany other instrumentalists / singers and the nine essential chord forms every player needs. There should be a lot of interaction so don’t miss this one! Rhythm, Comping and How to Play Chords Like a Pro!